Editor's Note: This is a first of a two part article on the early history of Japanese karate and the relations between two of the principal founders, Gichin Funakoshi, who many consider the founder of Japanese karate, and Choki Motobu. Part 1 will discuss the two men's divergent backgrounds, education, personalities and karate training. Part 2 highlights the two men's divergent viewpoints, approaches and the circumstances that led them to conflict. No matter what style of martial arts you pursue or how you pursue it, your approach will polarize people. Some practitioners will respect and admire your efforts while others will gleefully explain why you should never wear a gi (karate uniform) again. Martial arts affect people in a very profound, fundamental way. Because of that, divergent viewpoints on martial matters can take drastic turns for the worse...quickly. (1). One of the most famous conflicts between leading exponents of their art was between the two Okinawan karate masters who helped pioneer the introduction of karate into mainland Japan from their remote island where it was developed - Okinawa. The feud was between Funakoshi Gichin and Motobu Choki. Both are men of great fame and reputation, but in most ways they were diametric opposites. Funakoshi Gichin is the founder of what is now called Shotokan Karatedo. He is commonly referred to as the father of Japanese Karate, and rightly so. No one did more to bring karate to the forefront in Japan, and Funakoshi's efforts to get karate recognized by the Japanese Butokukai (the Japanese organization established by the government to oversee, preserve and promote martial arts in Japan) were immensely impressive. Interestingly, among his peers and teachers, Funakoshi was never considered a dominant fighter or technician. He gained his reputation as a gentleman of elegant thought; a man of philosophy, linguistic skill, political acumen, and of course karate talent. As for forms and technique...Funakoshi showed his wisdom there too by associating heavily with one of the great savants in modern history - Mabuni Kenwa. Mabuni's retention of kata was staggering, and many top tier instructors poured knowledge into him like a basin, hoping that he could help pass along their dying arts. Mabuni, like Funakoshi, was a refined man in terms of formal education and in knowledge of the Japanese language and Japanese social customs. Perhaps that is why they got along so well. But standing on the other side of the aisle was a man who they considered gruff and distant, but also a man who was a tremendous technician and fighter. This man was Motobu Choki, often referred to as Motobu Saru (the Monkey), named after his great agility, and he would prove to be the yang to Funakoshi's ever present yin. The development of these two men was as different as their personalities. From a class standpoint, Motobu was of higher dignity (the Motobu family having been high ranking nobles under the former feudal Okinawan kingship) than Funakoshi. Funakoshi's family possessed some minor status, but Motobu was from one of the grandest lines on Okinawa. It was his family that retained and passed along their family art of Ti, the Palace Hand (now known as Motobu-ryu) that reputedly was once taught to the Okinawan King and his highest inner circle of nobles. Despite this class difference, the growth of the two men would prove quite opposite from what you'd expect. Motobu Choki, being the third born son had no right to his family's prestigious art (teaching reserved for the first son only), but reportedly he often attempted to sneak peeks at his older brother's training. He was raised by his mother and did not receive the formal education of his eldest brother and there is some question whether he was literate at all, or if so to what extent. This may have bred resentment. In time Motobu retained techniques, practiced hitting the makawara and tested his skills in rougher parts of Naha (not uncommon among some karate students who wanted to test their abilities), whereupon he would engage in fights. Soon his prowess grew, but so did his reputation as a ruffian. At first very few teachers would take him as a true student. It took many years of slowly piecing together experience before Motobu Choki began training in earnest underneath instructors like Matsumora Kosaku (Tomari Te), Ankoh Itosu (although after a short time Motobu was reportable expelled because of his attitude), and Tokumini Pechin. Throughout his growth and maturation, Motobu was always regarded as a fearsome fighter, who developed more on his own, never having established himself as another's disciple. On the opposite side was Funakoshi. Funakoshi, while not possessing the remarkable class distinction as possessed by Motobu, was a bright and likable child who befriended the son of Azato Ankoh. Azato (a student of the legendary Bushi Matsumura) was a man of some prestige as one of the most prominent karate masters of his day (some crediting him as the founder of Shuri-te) as well as a former body guard to the Okinawan King, diplomat and advisor. He took a liking to young Gichin and became his first teacher. Later Funakoshi studied with another Okinawan karate ledged, Itosu Ankoh, who first introduced karate into the Okinawan school system, and created the Pinan kata. As a school student Funakoshi received a classical school education ultimately becoming a teacher himself. Like his instructor Ankoh Itosu, Funakoshi was in favor of Japanese reforms and quickly became a go-to resource for the Japanese on this still rather mysterious art of karate. 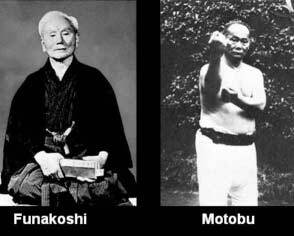 (The second part of this two article series will discuss Funakoshi and Motobu's differing viewpoints and philosophy, differences that propelled them into a natural conflict). Acknowledgement: I want to thank the Editor of FightingArts.com, Christopher Caile for many historical additions and clarifications he contributed to this article. 1- This isn't a new phenomenon; I imagine a lot of readers have experienced it. In fact, this kind of conflict goes back about as far as karate was recorded. One of the earliest examples is Sokon Bushi Matsumura (the great Shorin-ryu karate master, bodyguard to the Okinawan king and one of the teachers of both Motobu and Funakoshi) referring to Palace Hand (supposedly taught only to the King and highest court nobles that included many aikido-like techniques), or "The Art of Intellectuals", as light and formless, and rather incomplete. Matthew Apsokardu is a student and instructor of Okinawa Kenpo Karate and Kobudo. He is the founder of www.ikigaiway.com and his martial arts blog can be found on this site. Apsokardu has created multiple ebooks, including "Shigeru Nakamura: Okinawa Kenpo's Founder". Matthew is also the martial arts consultant.